There has been a trend of increasing U.S. urbanization over the past few years. The movement of Americans to metropolitan areas escalated when the economy began to improve in 2010. 2013 Data from the U.S. Census Bureau shows that there were 2.3 million more people living in cities that year compared to 2012. Altogether, about 270 million people were living in cities and surrounding areas in 2013. With urbanization comes an increase in urban waste. The United States is the world’s largest creator of waste, sending around 240 million tons of trash to landfills each year. Many people and businesses in urban areas are beginning to discover the benefits of recycling. Why Do Urban Areas Need to Recycle? The urban population growth has led to additional garbage which requires even more handling. In 2013, Americans recycled and composted over 87 million tons of waste, yet produced around 255 million tons of municipal solid waste. The most common types of solid waste in 2013 consisted of packaging, food, grass clippings, apparel, furniture, computers, tires, and refrigerators. This waste takes up space in landfills which will eventually run out of space. A major problem seen throughout the U.S. is the 80% decrease in possible sites for landfills. Garbage will always be produced and developing innovative recycling strategies can help improve the garbage handling process. By implementing new technologies and initiatives, urban areas can learn to make an even greater impact on recycling and composting. Increased recycling efforts can lower the trash sent to landfills, which minimizes costs. Besides reducing the amount of waste, emissions are also reduced since fewer garbage trucks are needed. Compared to landfills, the process of recycling decreases the amount of greenhouse gas (GHG) emissions, which leads to global warming. Recycling reduces carbon dioxide by around 186 million metric tons per year. Recycling efforts also benefit residents and commercial businesses economically and environmentally. Many metropolitan cities are moving towards the concept of Zero Waste which strives to reduce the amount of waste going to landfills and in return, increase the methods of recycling and composting. The City of San Francisco has already implemented the Zero Waste plan and is successfully moving closer to their goal of reaching zero waste by 2020. The Zero Waste plan is enforced by a San Francisco mandate that requires residents and companies to recycle and compost. The city has conducted several case studies which show how beneficial the actions of recycling and composting are for companies. Businesses, hotels, and restaurants have put these practices into action and are reaping the benefits of financial savings. The success of the Zero Waste initiative in San Francisco will only increase recycling rates in the future. In addition to San Francisco, New York City Mayor Bill de Blasio recently stated that the city will also implement a Zero Waste plan. The city’s goal is a 90% reduction in the amount of trash produced by the year 2030. Historically, the city’s garbage has been sent to upstate New York or out of state due to lack of closer options. Reducing the transportation of waste alone could save the city more than $350 million annually. In order to make the recycling process more accessible, by 2020, residential buildings will implement a single-stream recycling plan using one recycling bin instead of the two type stream used presently. The program for commercial buildings would be a model of the one used for residential buildings. Companies developing new technologies to improve recycling processes are eligible for federal and state R&D tax credits. Another example is the recently approved Connecticut Mattress Stewardship Plan, which is the first statewide mattress recycling program. The program offers residents free drop off of unwanted mattresses at designated recycling sites. Mattress retailers, hotels, military facilities, universities and healthcare facilities are getting involved in the program and other states such as California and Rhode Island are looking to develop similar programs in 2016. Recycling mattresses contributes to the Zero Waste concept by diverting mattresses from landfills leaving more space for other garbage. Mayor Bill de Blasio’s OneNYC plan proposal for businesses to separate food waste (and recycle it) from regular garbage aims to help reduce the amount of solid waste that is produced. The law would allow businesses to the option of collection by private hauler, transport the waste themselves, or compost on site. Hotels, arenas, and large scale restaurants would be required to compost, which would save more than 1 million tons of food from going to landfills annually. Specifically, restaurants in hotels with more than 150 rooms, vendors in stadiums with seating of 15,000 people or more, food manufacturers with at least 25,000 square feet, and wholesalers with at least 20,000 square feet will be mandated to divert organic waste from the trash. This proposal would greatly influence the success of the NYC’s Zero Waste program because of large company participation. Another aspect of the OneNYC plan includes the a mandate that all of the 180 million square feet of New York City Housing Authority (NYCHA) developments implement recycling by 2016. This aspect is a smaller part of the plan, which seeks to improve NYC and make it a cleaner and greener place to live. NYCHA stated that they will invest $15 million to build recycling centers and train the public on how to recycle efficiently. The city intends to encourage residents to get involved and teach them what materials need to be recycled. Upon implementation, this plan will further advance the city’s goal to increase recycling in New York City. Companies in the growing recycling industry need updated technology and methods to support the amount of waste being diverted from landfills. New York State has a Qualified Emerging Technology Company (QETC) Capital Tax Credit that can be obtained by businesses making qualified investments in a certified emerging technology company. There are two options to receive a QETC Capital Tax Credit. A four year holding period with a maximum credit of $150,000 for a credit calculated at a rate of 10% of qualified investments. A nine year holding period with a maximum credit of $300,000 for a credit calculated at a rate of 20% of qualified investments. The QETC Capital Tax Credit is a great option for New York State investors to attain if they choose to invest in a New York certified emerging technology company. Composting makes up one of the most significant parts of the Zero Waste plan. Of all the garbage discarded, food makes up around 15% of the municipal solid waste.iii Composting consists of the recycling of food scraps into a nutrient rich soil through bacterial decomposition. Food scrap and recycling programs mostly use the process of windrow-based composting. Windrow-based composting consists of a controlled aerobic decomposition process by putting organic materials in long rows (windrows) and bringing in oxygen by turning or forcing air through the windrows. Other viable options for composting consist of in-vessel aerobic composting and anaerobic digestion. Both of these techniques require vessels or fully closed containers to have a successful compost. Going further than just recycling organic materials, using certain processes, composting can lead to renewable energy which is just one of the many benefits of composting. A multitude of locations throughout the U.S. have done feasibility studies looking at the function of anaerobic digestion of organic materials from municipal waste. The anaerobic digestion system allows for the production of energy, such as electricity, heat and natural gas, by using the methane gas that is created during the composting procedure. A report prepared by New York City on new and rising technologies for municipal solid waste led to the discovery that anaerobic digestion and biogas energy generation technologies were less expensive on a commercial scale than the current practices for getting rid of materials. The study found that anaerobic digesters presented a better environmental performance than waste-to-energy facilities, lower air-pollutant emissions, and reduced dependence on landfills. 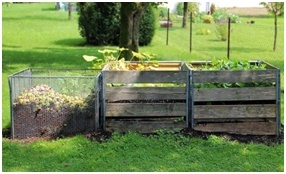 With the right technology, composting can recycle organic materials and create renewable energy at the same time. Innovative developments within the software industry have transformed the traditional methods of recycling and composting into more efficient and accessible processes. Rubicon Global, based in Atlanta, GA, provides comprehensive waste stream solutions to businesses nationwide, allowing them to reduce operating expenses and implement recycling and waste initiatives. Rubicon’s cloud based platform has helped customers attain higher efficiencies and low costs by managing data and mitigating risks. Rubicon utilizes enterprise resource planning (ERP) technology, big data, and predictive analytics to help customers manage waste and recycling across various locations and achieve sustainability and cost savings. Paradigm Software, based in Cockeysville, MD, has developed software to assist clients in handling and analyzing big data. Their CompuWeigh, CompuRoute, and WeighStation systems provide customers with fast transaction processing and solutions in the weighing and routing industry. The systems allow users to keep track of customer information, assignment of RFID tags to specific garbage trucks, and route transactions. Paradigm’s developed solutions allow customers to control and organize their data by using modern technology. Some of Paradigm’s clients consist of the District of Columbia, Maryland Environmental Services and Delaware Solid Waste Authority. AEON Blue Software & Development, based in Tampa, FL, has developed their Nexus Recycling Management System for recycling centers, scrap yards, metal recyclers and exporters, and paper processors. The company has been mentioned in magazines such as Recycling Today and Waste Advantage. The Nexus software, recognized by Recycling Today and Waste Advantage, is able to handle multiple processes including scale ticketing, inventory, commodities and pricing, law compliance, booking and containers, contract sales, container tracking, motor vehicle information, and employee management. The Nexus Recycling Management System is allows companies to handle all of their information on one platform. RFID (Radio Frequency Identification) tags are also being utilized to help cities with their recycling programs. There are an abundance of reasons why RFID tags are valuable for urban area recycling. RFID technology can communicate data between a reader and an object, such as a cart or dumpster to record data such as the location and the time of service at each recycling bin. The use of RFID technology can track who participates in recycling programs, find out what their participation rates are, determine how many recyclables per household, and help create quicker recycling routes. Cities can use the data produced by RFIDs to see which neighborhoods have a low recycling yield and can create incentives for increased recycling. RFID tags can function in adverse environments including extreme temperatures and exposure to gases and chemicals which make them ideal for recycling purposes. RFID technology is also an important part of the “Pay-as-You-Throw” (PAYT) recycling program in which garbage is charged by volume or weight. Data collected from RFID tags can be used to accurately bill customers for the amount of waste they dispose. RFID tags are essential when the PAYT method is used because it assists in keeping the procedure organized and reduces people customer worry about being accurate billing. Recyclebank, headquartered in New York, has created a recycling business that utilizes RFID chips. The company works in conjunction with cities and receives a part of their recycling savings. Recyclebank first worked with the town of Chestnut Hill, PA where residents received bins with RFID tags. Residents and small businesses that recycled were able to earn and redeem rewards which produced a quick response from the community and made this project a success, increasing the recycling rate from 30% to 90%. Soon after, Recyclebank established deals with large companies such as Coca-Cola, Macy’s, and Whole Foods Market. Today, Recyclebank stands as a model for recycling businesses and has applied their plan throughout various metropolitan cities throughout the country. Urban cities are becoming increasingly aware of the advantages of using RFID tags to assist with the recycling procedures. The City of Virginia Beach, for example, replaced old recycling bins with new RFID equipped bins. Not only did this cost Virginia Beach only $1.50 per tag, but the city has found that the benefits of implementing RFID technology are many. The emergence of new technologies has given way to advancements in the recycling industry, particularly in urban areas and this trend will only continue. Many businesses and residents in metropolitan areas are implementing recycling programs, whether because of mandates or possible incentives. Federal and state R&D tax credits are available for companies developing new technology and processes related to the recycling industry.